While it wasn't a surprise, Governor Jerry Brown made California's drought official on Friday. Federal climatologists affirmed that 2013 was the state's driest calendar year on record, with about one-third the normal amount of precipitation. Currently the Sierra Nevada snowpack is just 15 percent of normal for this time of year. But drought is nothing new around here. 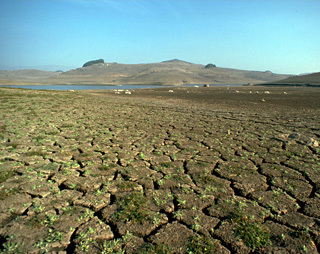 The 1987-92 drought lasted six years, when statewide reservoir storage hovered around 60 percent. The record for worst drought is still held by 1976-77, when low rainfall sent the state scrambling. Runoff was just 20 percent of normal in 1977. Officials now say we're on track to beat that low-water mark. 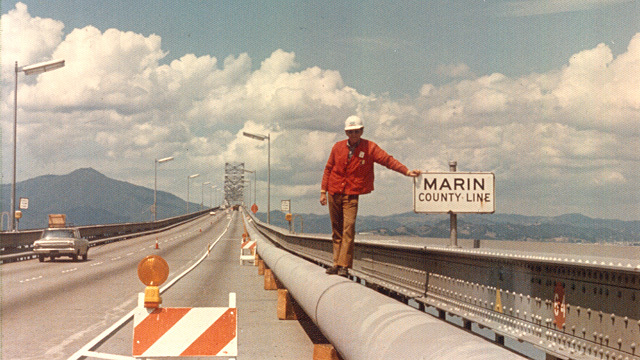 In 1976, an emergency 24-inch water pipe was laid across the Richmond-San Rafael Bridge next to the traffic lanes. Water reserves at the Marin Municipal Water District were critically low and the pipeline supplied the area with half of what it needed during the drought. Residents were ordered to cut their water use by 57 percent. City officials in Ventura considered using a tugboat to haul an iceberg from the polar seas and park it offshore to supply freshwater. 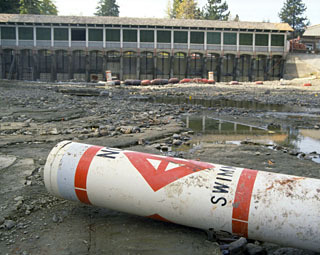 The strategy was part of a $175,000 study approved by the city council in 1990, as the drought dragged on. During several past droughts, Los Angeles banned serving water in restaurants unless customers specifically asked for it. The city of Santa Barbara instituted a 14-month ban on watering lawns during the late 1980s drought. Landscape companies began offering to paint dead lawns green. Billionaire Harold Simmons kept watering his 23-acre estate despite the restrictions and racked up more than $25,000 in city fines (a fact that led his obituary when he passed away in December). California’s "green" reputation is the product of sheer necessity, in many cases. The state’s water conservation policies trace their roots back to the 1976-77 drought. When dry weather returned a decade later, water agencies began offering rebates for low-flow toilets and fixtures. New standards were developed for washing machines and other appliances. “Compared to the 1970s, almost all of the fixtures in our home are completely different now,” says Lester Snow of the California Water Foundation and a long-time head of DWR. The low-flow fixtures and landscaping helped put a lid on water consumption after droughts ended, along with other policies. According to the Public Policy Institute of California, communities on the Southern California coast used almost 450,000 less acre-feet of water in 2005 than they did a decade earlier, despite growing by two million people. “There’s much more that we can do on conservation,” says Snow. “I don’t think we’ve pushed as hard as we can.” New conservation programs go beyond classic public service announcements and are using behavioral science to inspire water savings. Water shortages invariably lead to calls for more dams and reservoirs, like Diamond Valley Lake in Southern California, which broke ground in 1995. “There was additional storage built, because California’s climate has wet and dry periods, so you have to be prepared for something that’s erratic,” says DWR’s Maurice Roos. In June, Senator Dianne Feinstein called for expanding four state reservoirs, saying “if we don't take significant and rapid action, I fear California is at risk of becoming a desert state.” Proponents are hoping a revised water bond, postponed from 2010, will make the November ballot. The original draft had $3 billion slated for water storage projects (see our interactive map). Water from desalination plants, where seawater is turned into drinking water, is generally two-to-five times more expensive than other sources of water. But when dry weather hits and districts are faced with pricey water purchases and transfers, desalination starts looking more attractive. The city of Santa Barbara built a $34 million desalination plant in 1991, after facing drastic water shortages. Once the drought ended and water prices went down, the plant couldn't compete and was decommissioned. Water recycling plants, like those in Orange County and Silicon Valley, are also costly to build, but offer a way to reuse wastewater. In an average year, groundwater makes up about 25-to-40 percent of the state’s water supply. During the drought in 1977, groundwater made up 76 percent of water used in the San Joaquin Valley. Groundwater levels are still dropping at alarming rates in many parts of the Central Valley. Droughts often create flurries of new bills in the state legislature. “With this drought pressure, I think you’ll see a lot more legislative attention on: what should we be investing in to make sure that the next time there’s a drought, we’re better prepared than we are today,” says Snow. The hardest part may be keeping public attention on California's water problems once a drought ends. “Quite often, we end a drought with a flood,” says Roos. The 1987-92 drought went out with a roar. In December of 1992, rainfall was double the long-term average, creating severe flooding in Southern California. Roll mouse over the graph, below, to see data for individual years.